Founded in 1989, Fisem boasts many years of experience in the industrialization of items for the motorcycle field, electronics and electrical household appliance thanks to the cooperation with prestigious companies. 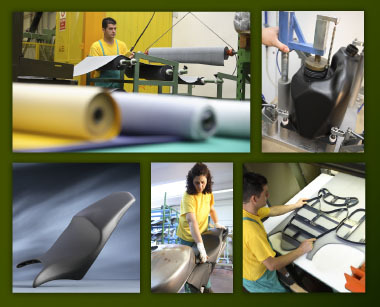 Motorcycle seats and plastic tanks are the main products manufactured by FISEM. The company also performs thermoforming of laminated plastic, and recently, within a strategy of growth and diversification, has started to produce upholstery for private and public transport, as well as seats for gym benches. Guidelines of the company mission are flexibility, to offer the customer the best service, constant innovation of the production line and personnel training; a winning strategy which led FISEM to company development and success. To satisfy the customer's demands, FISEM cooperates and supports the customer from the very first design stages, trying to meet the customer's specific needs, thanks to a dynamic organization and to its staff experience. Constantly oriented to innovation, FISEM can count on the latest models of polyurethane molding machines, on the last generation of blow-molding presses with different capacity, and on many working centres for drilling and cutting operations. Constant staff training, accurate selection of the materials and the support of advanced checking room equipment can warrant quality products according to the specification of the customer's design. A quality certified in conformity with UNI ISO 9001 and UNI ISO 14001 standards.